Kit Fisto and Aayla Secura have seen some play recently and while it might not be stronger than eAayla/eQGJ2 or eYoda/eQGJ2, it does have strengths of its own. Also ... this deck will definitely need a lot of revamping (for Standard format) after rotation since a number of the key cards, i.e. Guard, Destiny, Close Quarters Assault, etc. will be ineligible and I also expect it to be too weak for Infinite. 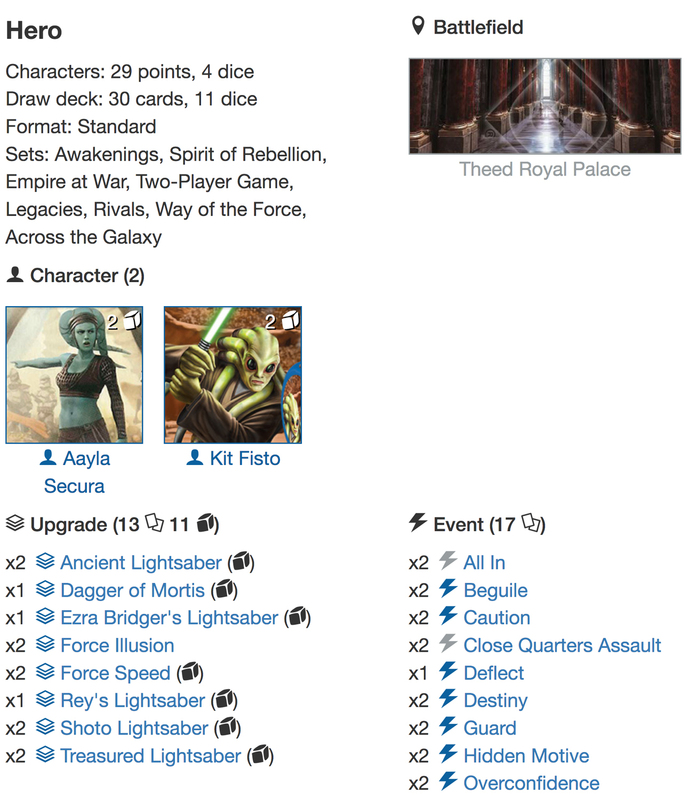 AAYLA SECURA was nerfed some time ago and is now 10/13, which is fair considering her power level (but figthing it out with Yoda for the same spot in character teams is tough), but it also meant that the duo of eRey2/eAayla/Profitable Connections was shattered, and while it's still ok with Fortify, it's just not really good enough. Attempts at making eRey2/eLuke3 the new monoblue hero midrange power deck also never really took off, but will KIT FISTO succeed where others have failed? While Kit Fisto's 3 Melee for 1 resource side is annoying, he's also just 13/16e. And with the built in ability to remove one of his character die showing Melee damage to block damage equal to the value of that die, at least there's a use for the side even when you don't have any resources to resolve it. And the ability is pretty good. It works both as a deterrent for your opponent to go after Aayla Secura instead, which you want them to, and provides for some decent "free" mitigation. Recently, Bobby Sapphire of the Hyperlooops did a piece on Aayla Secura, which you might want to read as well to provide a bit of context! ANCIENT LIGHTSABER, EZRA BRIDGER'S LIGHTSABER, SHOTO LIGHTSABER and TREASURED LIGHTSABER are your basic 2cost upgrades. You want to see one of these in your starting hand! The Ezra Bridger's Lightsaber could be an Heirloom Lightsaber as well if you don't mind a more steep cost curve for your upgrades. I've also seen a number of iterations of the deck include Vibroknife. It's not in this version because it cannot be used with neither Destiny nor Guard and although it has two +2 modified damage sides does not feel that much better that the Shoto Lightsaber. The ability to bypass shields and Force Illusions is pretty good though! DAGGER OF MORTIS and REY'S LIGHTSABER are your redeploy weapons. Rey's Lightsaber narrowly takes the spot from the Heirloom Lightsaber because it is marginally better with Guard and Destiny, and while the 3 Melee side for 1 resource can be troublesome at times, it is has been a high performer in almost all my test games. If you can manage to get any of these 2 weapons down round 1 courtesy of a Destiny play, you can really pull ahead in the game. FORCE ILLUSION is a staple and helps you with your balance between being the aggressive and/or defensive deck, while FORCE SPEED seems to again become much stronger in the current format, while it can also help set up some great All In plays and generally let you put pressure on your opponent. If you are a regular reader of our deck analyses, it's probably no surprise to you that we like DESTINY as a ramp card for monoblue heroes! We've already talked about it extensively, and Kit Fisto's dice are pretty dope for Destiny plays! 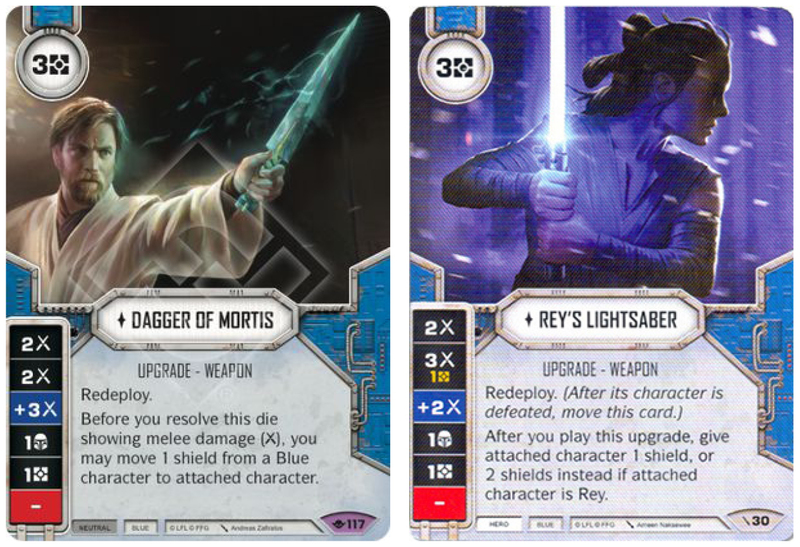 50% of his dice sides allows you to play a 2cost upgrade while his 3 Melee side (or a combination of die sides) lets you play either a Rey's Lightsaber or a Dagger of Mortis. 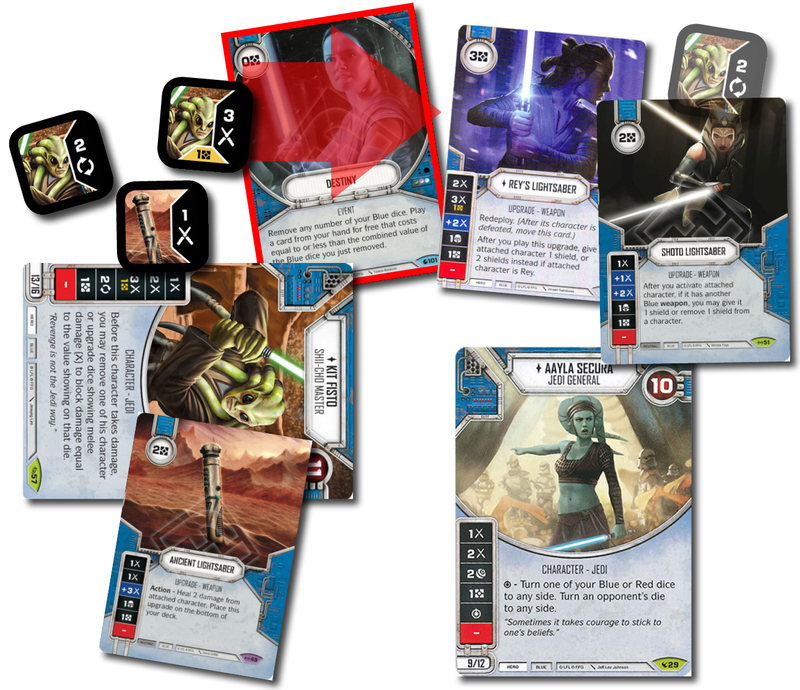 Because of Kit Fisto's passive ability, that allows you to use the 3 Melee side even if you don't have resources, you will almost always want to play a 2cost upgrade THEN get dice in the pool. The only instance where getting Kit's dice in the pool first is better is probably as a a response to a big damage roll from Darth Vader or if you have a Guard in hand. Because the Destiny plays are so incredibly powerful, the Treasured Lightsaber is probably one of your best 2 cost upgrades for the first round as it allows you to draw an extra card to set up the combo pieces. 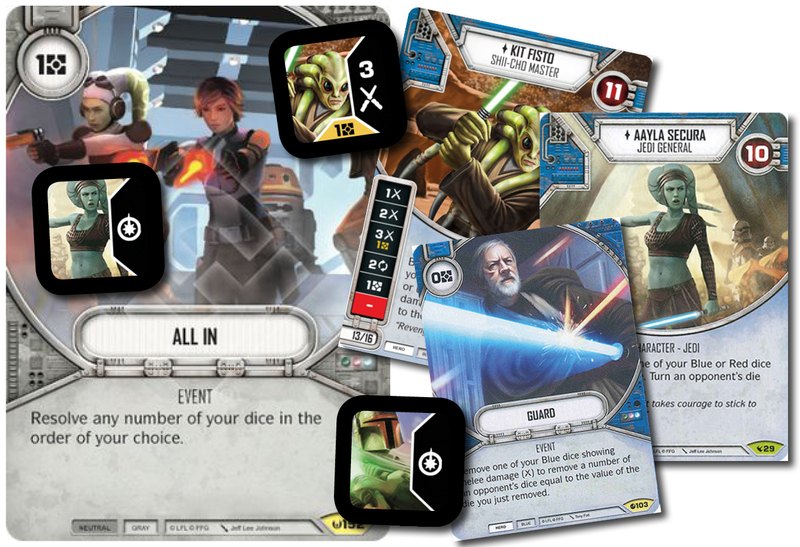 Both Kit Fisto and Aayla Secura are great characters with All In as they can both turn dice! The All In plays can both be proactive, turning to damage sides for lethal damage or reactive, turning to damage sides to prevent damage, either coupled with a Force Speed Special for Guard plays or using Kit Fisto's passive ability. CAUTION has sort of fallen out of favour with a lot of players, but it is still great! 3 Shields can be a huge damage swing and if it is used to mitigate 3 damage then it is functionally a He Doesn't Like You. Trading a Blank for 3 Shields is pretty good! GUARD is in this deck. You have loads of blue Melee sides and it can be a blow-out card if you hit a first round +3 Melee side on an Ancient or a 3 Melee side on Kit that cannot be resolved due to lack of resources. Generally this deck has plenty of ways to make use of dice that cannot be resolved, which really ups the efficiency of it! I'm not a huge fan of HIDDEN MOTIVE, but it's 0cost mitigation and as long as Vader is running wild it probably should be a staple. BEGUILE is currently much better than Mind Trick, but that's just due to Vader, feel free to run a 1:1 split between the two. DEFLECT is mostly to give a bit of protection against FAT Vehicle decks and Vader's Fist and there are still plenty of Ranged damage sides floating around, so I'd keep it for now. I did consider, albeit briefly, to tech in Force Misdirection instead, but that's just be getting terrorised and paranoid! OVERCONFIDENCE is awesome in a monoblue deck. Affecting two dice for 1 resource: GREAT! And Kit Fisto has great dice for Overconfidence Battling! 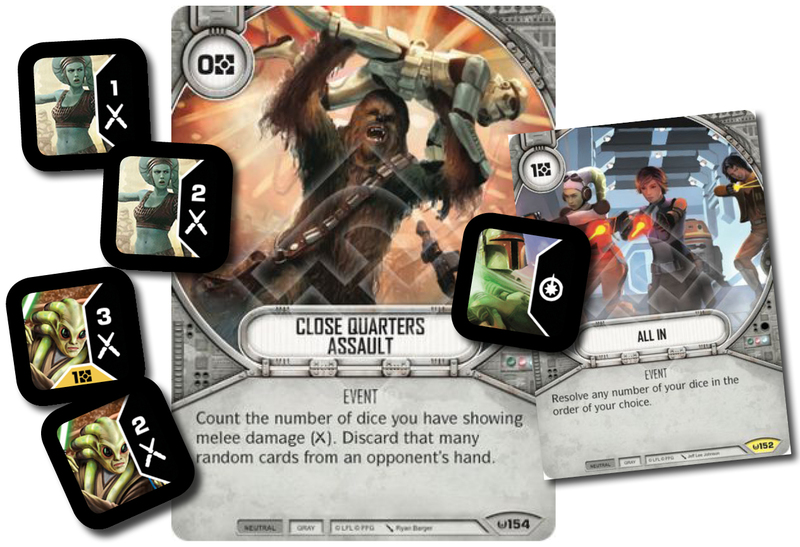 You will normally be able to CLOSE QUARTERS ASSAULT for 2-3 cards right off the bat, and increase the numbers as you get more upgrades down. If you start the game with a Destiny play to get 2 upgrades down, you will often be able to threaten to annihilate your opponent's hand every time you have a Close Quarters Assault in hand. You can even set it up with a Force Speed Special and an All In, turning dice and removing your opponent's hand before hitting him for damage! My preferred 2cost upgrade is Treasured Lightsaber. Getting that extra card to be able to draw into your combo pieces is great and it's a pretty solid upgrade if you can hit that Aayla Special! 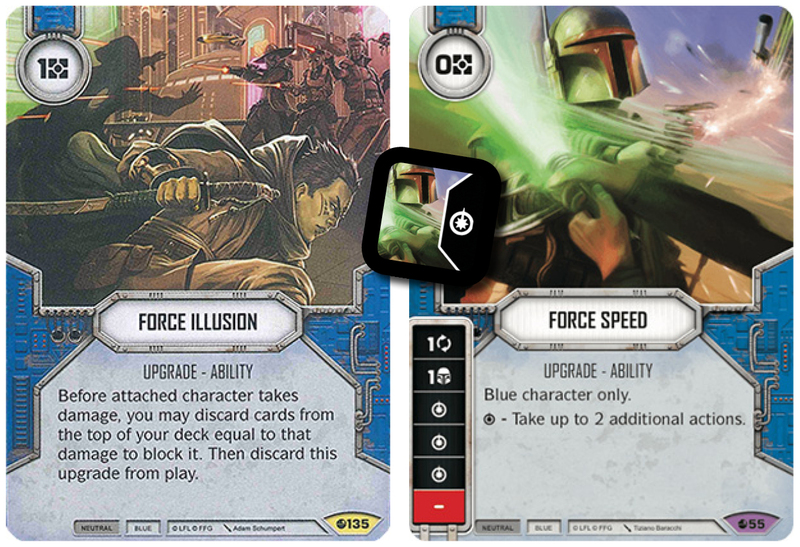 I'd always keep at least two 2cost upgrades, but would dump any 3cost upgrade unless you also happen to have a Destiny in hand and/or are starting on your own Battlefield (and you chose to go with Theed Royal Palace). Guard, Caution and Hidden Motive are all great round 1 mitigation, while Overconfidence and Beguile should be mulliganed out. Close Quarters Assault stays as well if you draw it - especially if you have the Treasured Lightsaber. The priority is to find your 2cost upgrades, so mulligan hard for those. You are going to fight an uphill battle if you don't get any upgrades. Everyone chooses Theed Royal Palace and there are good reasons for that. It gives you plenty of options in round 1 and enables you to pull off powerful plays. You are not the fastest deck around though, and going with Obi-Wan's Hut might in fact be the safer choice. ASK Gaming Cafe expat, and our spy in the UK, Matthias Lund-Andersen recently won a 33-player Regional i Woking, UK. 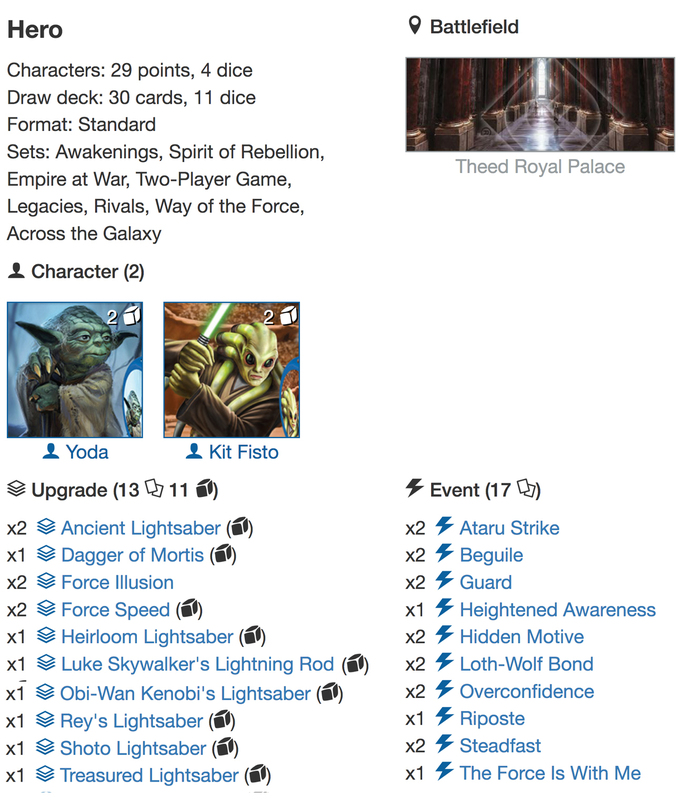 He used this alternative eYoda/eFisto list, and it does indeed look spicy. Click the deck list to go straight to his in-depth write-up on swdestinydb. As a Patron you support the YOUR Destiny website, podcast and YouTube Channel, and you help us to continue providing content for Star Wars Destiny. We are a dedicated Destiny website and release articles almost daily. As Patron you also get early access to most articles, including this one, and can enter our Patron only Discord Channel. Advanced and Expert tier patrons get access to exclusive training and test videos. Thank you for your consideration!